Market Sentiment Watch: BOJ introduces somewhat unexpected stimulus and futures are surging. This also is driving the dollar higher and crude back towards $80. In energyland, nervous energy group conditions persist. We continue to see current energy group action as the ongoing formation of the "sideways trade" in both E&Ps and Oil Service with the expectation of a tightening range (lower highs, higher lows) between now and late November as the OPEC meeting approaches. In today's post please find the natural gas inventory slide show (slightly bigger than expected injection), some thoughts on quarter to date earnings items, and some other odds and ends. Crude oil retreated $1.08 to close at $81.12, erasing the prior two day's mini bounce on early session dollar strength and on word of a slight increase in estimated OPEC October volumes relative to September. We see increase in OPEC production as quite predictable given that 4Q is the peak for global demand. We media comments that OPEC won't cut production or won't cut enough or will cut but it will too late to save oil as completely speculative in nature. We continue to see Saudi Arabia and key players Kuwait and UAE and now the head of OPEC's apparent laissez faire attitude towards current lower oil prices as a bit of brinkmanship with weaker players who always call for cuts but wish to shoulder none of the cut back burden. We also do see Saudi and the rest of the group as not wanting to be the caught in a repetitive cycle of trimming production annually to offset gains by the U.S., over and above global demand growth. It is important for people paying attention to the supply demand balance to remember that global demand remains solid at over 1.1 mm bopd annually and that growth in U.S. production alone does not quite offset that demand growth by itself. We've noted some who seem to think that if the US grows 1 mm bopd that Saudi Arabia or Saudi and friends will need to cut 1 mm bopd ... this is simply not the case. This morning crude is trading off with an eye on $80 with the BOJ inspired further rally in the dollar. Iran / OPEC Watch: Keep November 24th in mind - nuclear discussions deadline between the big 6 and Iran, especially if your focus is short term. Should Iran be dubbed a good boy once again the impact on global crude prices will be negative unless OPEC takes immediately market accommodative measures which they could do at the ordinary group tea on the November 27th. Natural gas edged up another $0.04 to $3.83 yesterday as traders eye a potential winter storm this weekend in Appalachia and after EIA reported an essentially in line (if oversized for this time of year) storage injection. We continue to see storage peaking just over 3,600 Bcf, up to 3,700 Bcf which is modestly supportive for natural gas prices as we start the winter. Our sense is that to support our 2015 $4 average price target we need: a) normal-ish winter weather for 2014/2015 followed by an actual summer, b) a continuation of strong, non heating related Industrial demand growth into next year, c) lower net imports (increased exports to Mexico) and lower volumes again Canada with flat (near 0 LNG imports- and we are pretty sure we will get all of this), and d) a moderation of the growth pace of "Other States", TX, and OK production volumes (in part dependent on oil prices). This morning gas is trading higher on blustery weather invading the middle and eastern thirds of the country (it's actually going to freeze here tonight which is a big change from the 80 degree temps earlier this week). SLB (unowned) / HAL (owned) - kicked off the 3Q14 energy reporting season with confidence both globally and in North America regarding activity levels. Outside of trouble spots in Iraq, Libya, and Russia international operations appear to be getting stronger with deepwater seemingly a safe haven of activity (long lead time high capital projects take longer to sway due to bobbles in oil prices so this makes sense). Mexico seen as a brighter point than in recent years. NAM pressure pumping prices seen as un-pressured (so far) and they don't see capacity adds there (on the way now) as pressuring prices either. Overall capital budgets of their customers were seen as largely intact but potentially slowing, kind of dodged answering since E&P's are running budgets now. CLB (unowned) - main points - 1) posted almost all record quarters by segment, 2) sees oil prices stabilizing in 2015, 3) sees global oil production continuing to be challenged, 4) sees deepwater projects greenlighted at current Brent pricing, 5) at $80 to $85 WTI in 2015, see rig count slipping in fringier parts of Bakken and Eagle Ford (but stage counts maybe not), 6) We're watching the name more closely now in the wake of the recent retreat for a potential add and will be gathering thoughts for a go/no go decision once the quarter settles down in two more weeks. OII (unowned)- main points - 1) record quarter across business segments, 2) sees growth in all segments in 2015, 3) Guidance for 2015 was light due to a "little bit more uncertainty [regarding upstream capex] than we have had in a decade", 4) expecting to maintain strong margins near term, 5) noted it's too early to see any significant shift in their marketplace due to oil price weakness. NBR - (unowned0 - main points - 1) no push back yet on rig day rates in lower 48, 2) rollover rates have been healthy so far reflecting still strong demand. We'd add we've heard of a couple of rigs that are being taken out of play for 2018 including one at EOX (but plans same well count) and maybe one out of PVA. COG - main points: 1) reaffirmed guidance, 2) sees Marcellus area natural gas pricing improvements by late 2015, 2a) so far 4Q differentials look like the wide ones seen in 3Q, 3) increasing emphasis on Eagle Ford going forward (but it will remain quite small compared to Marcellus for some time), 4) expect more share repurchases at current stock price level. SWN - main points: 1) Fayetteville wells continue to get better, 1a) upper Fayettevile wells encouraging, 2) Marcellus continues to be the primary growth driver, 2a) Marcellus showing encouraging well results in new counties for them, 2b) Upper Marcellus wells in process with results on 4Q call (and thinking upper will work over a broad swath of acreage), 3) Guidance for 2015 well after they've closed the Marcellus acquisition in northern WV announced in October (we should know one way or another on the deal in another 2 weeks), 4) encouraged by the amount of new natural gas demand materializing in NAM. RRC - main points: 1) we're going to keep growing at 20 to 25% for a long, long time 2) we've got transport for our gas arranged ahead of time so we don't outgrow our ability to get gas to market, 3) we've greatly increased the number of markets we sell into, 4) look for better pricing in 2015 on the back of winter early on but also more ethane processing and better differentials as the year progress as 34 Bcfgpd of planned pipeline capacity begins to help Appalachian gas get out of the area. PVA - main points. 1) very aware of oil prices, 2) key consideration when looking at budget is keeping balance sheet in good shape (net debt to EBTIDA < 3x) and liquidity of at least $200 mm, 3) Likely we see them alter the previously released preliminary 2015 capital budget to ease back on the capex throttle due to lower assumed oil prices - they're really the first guys to strongly suggest they are going to do this this season (look for new guidance around year end but expect them to still grow oil strong double digits), 4) about 57% hedged now as volumes are seen but will be more hedged than that if/when production estimates are dipped (we don't see them shaving by much, perhaps the planned 8 rigs drops to 7 or 6.5 for a yearly average), 4a) no desire to hedge down here further for 2015, maybe will add for 2016, 5) never more enthusiastic about the Upper EFS which is showing off big wells and shallow declines. WLL - main points. 1) KOG acquisition on track for close before YE14 (we note the already tiny arb spread collapsed further post call), 2) 2015 budget and guidance cannot be officially given until deal closing for the pro forma combined ... but they said they see near 20% growth of the combined in 2015 on a $3.8 B budget which is the combination of what the two spent in 2014, 3) They do not see altering their spending and growth plans down to at least an estimated $75 or even $70 WTI price in 2015, 4) Bakken / Three Forks results continue to impress as they hone completions by area, 4) First Nio C and Codell wells in their DJ Basin project (Redtail) were stronger than expected from short lateral wells due to high stage count. NFX - main points. 1) Nice volume based beat driven by strong growth in SCOOP/STACK, Bakken/TFS, and to a lessor extent Uinta, 1a) drilling best in class wells in 3 main plays now, 1b) noting a clear preference for Plug N Perf completions, 1c) Eagle Ford didn't get a lot of air time on the call, we muse that it could be sold for the right price, 2) SCOOP/STACK hit annual expect exit rate, 3) Getting oilier by the quarter, unwavering focus on liquids, 4) STACK play becoming more delineated with stronger than expected economics, 4a) New Springer Play has strong economics as well, 5) heavily hedged going into the quarter for 2015, upped it and now at 79% of currently expected oil volumes for the year at about $90, 6) Balance sheet in great shape at 1.5x net debt to EBITDA post quarter, 6) prior 3 year budget based on $90 oil, not a lot of impact to cash flow at $80, and $80 oil expectation would push spending to lower end of prior $1.6 to $1.8 B guidance, 7) China - on track for first sales and for a sale near year end 2014 (high value target and not a seller at any price). NBL (unowned) - Wattenberg points: 1) definitely seeing better economics via extended reach laterals and will increasingly drill them where possible, 2) encouraged by downspacing results, 3) liking Plug N Perf wells more. Other key comment: "It's not so much a question of your break even economics; it's a matter of managing your cash flow and your balance sheet"
SYRG (unowned) - 1) wearing big boy pants and not knee jerking the budget over short term moves in oil prices saying budget was designed for $75 oil with strong returns produced at $60 oil without benefit of lower service costs that they would expect to see at that oil price deck, 2) in discussions with service provides now regarding costs, 3) Noted that they continue to add acreage in the Wattenberg (and they weren't kidding given today's add), 4) Sees PnP as encouraging but not seeing the bigger uplift some are reporting, 5) testing Green Horn soon, Nio A after that. 6) not yet giving full year guidance. SM (unowned) - 1) program was planned for $85 oil, still nicely economic below that point, also not knee jerking budget around on oil given strength of balance sheet, 1a) Expect disproportionate oil growth going forward, 2) seeing same lateral cost per foot for bigger fracs in the EFS to good economic effect, 3) seeing strong results in Permian due to a switch to gas lift, 4) Noted Gooseneck wells (Divide County, ND) some of best in entire portfolio in terms of return (AMZG is next door), 5) Quarter only missed due to unusually high amount of well shut ins for offset well completions and are hopscotching now in order to minimize the impact of new completion related shut ins. Takes acreage to over 35,000 net acres in the core Wattenberg and pro forma production (1QFY1 mid point guidance plus the figure above) to ~ 9,400 BOEpd which on a pro forma basis puts them trading at $116,000 per flowing BOE as of yesterday's close. We note that BCEI, with a much larger footprint, also trades at about $115,000 per flowing BOE at present. Pre-nutshell: We would expect the deal to be fairly well received and will have more thoughts after the call. Please find below a pro forma cheat sheet; we don't have an active forward looking model ready here but will make adjustments to our thoughts on EBITDA (which will be going up simply due to the bolt on) after the call. Were one to lob $40 / BOE for EBITDA (a nod to lower oil prices and their hedges) on the new production and assume it held flat in the current year that would drive the EBITDA multiple for the near year multiple (FY15) from 6.6x as noted in the sheet below to just under 6.0x. Not cheap but not expensive for what you get either assuming they don't get overly aggressive with the bit in the coming year which we don't see, having listened to their 4QFY14 call earlier this week. CC today at 9 am EST. Next week we get reports from: AREX (unowned), AR, BCEI, CLR (unowned), CPE, CRZO, EOG, EOX, GDP (unowned), HCLP (unowned), LPI (ZLT G accounts only), MRD, MTDR, NOG, and OAS. Look for more Sand Player comments next week. WLL - Barclays cuts to $85, stays Overweight. SM - Barclays cuts to $77, stays Overweight. OII - SocGen cuts from $85 to $76, stays Hold. This entry was posted on Friday, October 31st, 2014 at 6:22 am	and is filed under SYRG, Uncategorized. You can follow any responses to this entry through the RSS 2.0 feed. You can leave a response, or trackback from your own site. 2. China now has a growth rate of roughly 7% which is hardly slow. Perhaps a bit down on recent years but nothing to scoff at and a strong engine for energy demand. There continues to be a lot of change going on in China at very senior levels and may continue for a further year or more. Very hard to predict but seems unlikely that energy demand numbers are likely to slow down.Time will tell but there are few indications. New leadership is continuing to try and tighten their reins on power. PVA – KLR, in a rare move of late, ups target by $3 to a whopping $22 vs the current $8 ish level and stays Buy. re 7 – noise in front of November data points and news flow. re 8: You have the right mindset. Unfortunately, for PM's and end of month, its a killer. – again, deal should be well received. re 7- just watch the dollar for short term direction. re 12 – perhaps in part. I chat from time to time with on SA, smart guy, but there' nothing really new on the balance sheet we didn't know quite some time back, it's the local differentials that have put the kibosh on the local group including REXX. Notes…… Mkt cleared congestion below 1985.50 CHVN Demand volume weak. Ease of movement positive. Mkt extended on price and breadth. Extreme small cap overbought. NQ relative strength. Fear and Greed = Fear. A) Very similar, they've been choked back, shallow declines,calling it an "extremely strong area"
Noting that in the north they are really challenged on line pressure and its being worked on as well but this helps to diversify production geographically (so they don't get slammed). A) The non-op in the queue is already paid for in the acquisition. A) Said in the south, they saw now data to support that so far, but have drilled to HBP instead (and that seems to be working fine), the private they are taking this from (Ivy?) has been doing them west to east as well. A) Said the sellers liked the SYRG operations, also helps keep debt where they want it, noted they are buying below what the seller would generally like (not this deal in particular but in general) and they tell the seller you can get your upside by taking our stock and not just our cash. Q WI% on the 7 hz wells that are waiting on completion? A) working it now, have looked at a 3rd party reserve report, helped with the credit facility, working to refine. Noting J-sand and Sussex targets from a horizontal standpoint could work on south end. Call wrapping up, positive tone, estimates to rise on the acquisition, pre / post EBITDA multiple likely to be about the same. very confusing how S&P can get over 2000 mark with energy weak as it is and not contributing to the index. Z: Thanks for the summary comments. Helpful. XOM & CVX had killer earnings. Mostly from downstream businesses. re 18 – your welcome and saw that, not my area but watched them try to drive up the XLE this am. Chicago PMI way ahead of estimate. Getting ready to add more small bits. re 9 – hear ya monthly. I don't really understand the reaction in Crude and other commodities like gold (down) with Japan doing a monster stimulus (15% of GDP per year) outside of dollar strengthening. This market is so screwy, every move gets pushed to extremes. Is this performance chasers piling into winners and dumping losers or is it algos that exacerbate market "trends"? BCEI – Added 25 shares in the ZLT G Accounts at $42.25 on further group weakness. Expecting catalyst laden 3Q earnings report from them, week after next. Addition keeps overly cheap BCEI in the #2 spot in the ZLT G accounts. MRD – Adding an opening position here of 75 shares in each of the ZLT G's at $26.10. Gassy, high growth, good balance sheet and capex balanced with cash flow aided by strong differentials and there is the potential for an oily catalyst due out on the 3Q call. We own a starter Core here as well in the greater ZLT. Italyinvestor – coms check, how are you of late? re 22 – you're last phrase sums it up pretty well. Always swings too far. And there is no need fundamental data since June to support a further push lower. Brinkmanship yes, but the data hasn't changed. Unless you work at IEA and then your estimates for 2015 demand growth were just too high in the first place. re #17 " confusing" I hear ya…. re 26 – in general, over longer periods of time, the SPX will have a very difficult time moving higher without the energy sector. In other words, this is an extremely rare divergence. Just remember S&P highly affected by AAPL. and remember that product pull is highly affected by prices. More people back to work + $3 gas = bigger holiday season = higher gasoline and distillate demand. 4 weeks from now refinery throughput should be up about 1 mm bopd over current. From 2000 til now the US$ has been more weak than strong and accordingly energy as a broad sector has outperformed for the most part. This year has been the exception. The relative underperformance this year sure does not feel good. A very bad trick or treat surprise. This too shall pass but I for one have not been as diversified as a should. Shame on me. Volume Seeing above average volume (demand side) after the opening rotation down this morning. Part of the balancing trade on this zig below acceptance. Listened to GS crude analyst. Twice. Basically lower thoughts on China and Europe (I get the Europe with Russia impact and economy in general but China we shall see) and he didn't quantify on the air impact to 2015. And then he closes with US shale growth saying it has outperformed expectations to which I'd retort, no it has not unless you are talking liquids and not black oil. Black oil has grown about as we all expected start to finish this year, basically ending at 9 mm bopd for the year now, maybe we go a little higher but we'll also see seasonality impact completions in the states as Bakkens and Permians and some Eagle Fords drill through winter but sequester frac spreads to pads and in general reduce spread count during the coldest months. re 34 – I know. I rarely yell at my TV. But when I do I choose to yell it's at CNBC. Revisionist crap. Thanks for the tip on her, I thought for a moment he was going to get all soft balls. PVA- trading a little stronger. #41 Re PVA Yep…noting higher lows and lower highs around the CHVN/Acceptance level at 7.75. Today's twitch down below acceptance was a buying opportunity if you wanted one. With a break above 8.65 there is a low volume area with room to run if/when. EOG Leader holding balance easily after morning rotation. CHVN at 91.51. Continues to tighten around that level, waiting catalyst. re 33: many share that sin Tom :). FWIW for my personal accounts ZMan thinking has dominated half my assets; the other half is 401(k) which is a balanced portfolio approach and my kids accounts are diversified equity portfolios (great returns this year) plus cash. I have found this to be a reasonable way to do things; if nothing else it makes the anxiety of market drawdowns bearable; painful this year no doubt but bearable. re 36 – I happen to catch him speaking, Did I also hear him point to XOM reduction in cap ex next year as an example of how the US shale players will be cutting supply in response to the lower oil price? I don't think of XOM as a shale player, but maybe I miss heard. re 49 – he did, have not looked for a breakdown on the spending reduction or if it was all upstream and NAM focused. They are in a number of shale plays from the Bakken via XTO to the Haynesville, both oily and gassy plays. Will grab the call transcript to see if they break out the capex cut. Crude down 1% now, $80.30. Z – sorry if I don't know how to navigate around your site, but do you have a recent note on REXX. Winter is looking strong and trying to find beat up natty names to add to on this dop. Article this am ridiculous – sell rexx and buy BCEI. Two totally different stories. XLE re 22,26,27 S&P Energy sector rejecting recent acceptance (86) as too low, testing near resistance 86.78( looks suspect as resistance to me). Crude Oil Futs (CL) Holding swing lows, acceptance is higher at 81.25. Heh, CNBC retweeted my comment on GS and revisionist history of calls. re 58 – I'd put that in the unlikely category. Offtopicthirty, grabbing lunch, back in a bit. CL-Z,do you read any significance into the cl futures contracts, ie backwardation or contango? 12 months futures have been in backwardation for fair amount of time recently. TPLM: Didn't think we'd see these levels, given the assets they hold and the relative cheapness of the valuation. Perhaps mgt and WLL didn't think so either. TPLM shareholders might have a hard time turning down a stock deal from WLL that valued TPLM in the $12 range it was trading at this past summer. I doubt anything will happen until after elections, OPEC mtg, and KOG closing but WLL should be thinking about (or negotiating) it now. WLL should be able to better utilize the midstream and drilling assets than TPLM alone, which would enhance value to WLL. The TPLM leasehold would be a great fit in WLL's portfolio. An end of year deal would be interesting. re 62 – in passing, I watch it, note it weekly, we were in a fairly steep state of bacwardation earlier this year for quite some time, made it harder to hedge (or at least a more difficult descion), very flat now looking 12 months out. re 63 – really don't want to see them go away at $12. Oil's been off 4 months now. $12 is way to cheap for what they've built. Nrgyman….diversification is important i agree….same mistake here…had a few banks that i held for a while which i traded in for more energy names as the shares started to come down. hindsight that was a huge mistake as my portfolio would have seen much less of a hit if i held on to the banks. re 64 – nice swing on the day in general, here, doing some light reading, shout if you need something. Z – What I am hearing is that for next 4 – 5 months (I know too short term for your thinking) that the Permian could get the lion's share of E&P adds. Reasons: 1. Cost/well for same EUR lower. 2.Better winter weather issues vs Bakken 3. Differentials and ease to markets slightly better. Takeaway getting better more quickly. Would you agree? re 2 – Not really. An EUR is not an EUR is not an EUR. Permian is going to be gassier in general. Weather I don't care about so if they want to sell people on that I'd say fine. Disagree re differentials and point to 2H14 to date with better Clearpoint pricing vs what has at times been blowout differentials for the Midland-Cushing. Takeaway getting better more quickly I don't get, you mean that Bakken? There is no difficulty with takeaway right now at all out of the Williston. 70 Takeaway. Maybe not so much in how, but rather the expense moving lower in that 4 – 5 month time frame. Wattenberg names leading the oil names today. 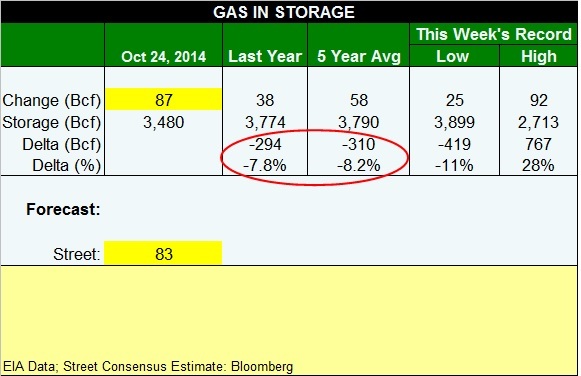 Natgas names getting a cold weather boost. PVA–leverage works both ways–it is way cheap now. any rumors around on GDP asset sale or JV announcement? re 73 – nothing within the last few weeks. Will check with BOP. Oil bouncing off lows of the day, cold weather is making people nervous I think. re 80 channel check on Friday not yielding anything new re GDP, other than mild concern over a lack of Cotton Valley asset sale. Crude Oil Futures…Showing well defined levels…81.25 the volume pivot. Noting demand volume going positive off the swing bottom this morning. Ease of movement still heavy. Wattenbergs moving nicely as well. Zorg – got thoughts on MRD and HK here? BCEI's 2 point moves up/down every day I guess tell me it is aa day trader fav. The wrap will be out by 1 pm EST Sunday. MRD Has always been hard for me. Not enough data and a very choppy profile that's still trying to define where value is. Wish I had more of it. RE 76: XOP is nearing, hard to believe, a triple-top breakout on the P&F chart. A print of $62 will do it. RE 91: XOP also showing an inverse head and shoulders pattern, with the neckline at 61.49. A break of this neckline projects to around $67, which also happens to be around where the declining 50 dma is heading. At least from a chart view, the $61.50-62.00 is important for the XOP. Today's close was $60.87 for reference. thanks for the detailed explanation….going to re-read that response over the weekend, but generally i get the concept…today was a confirmation that the 59 handle on the XOP being broken was rejected and got back there and started to test higher level…that rejection confirmed that for now the 59 area is most recognized by both sellers and buyers as fair trade and movement in either direction has to be confirmed by a move that violates that area in either direction. not asked was –does this imply you are not worried about a drop in oil price? re 96 – they continue to handle themselves well. Given the lack of real dip in the shares, it makes sense to make use of their shares as currency. Southwestern Energy (NYSE:SWN) is initiated with an Outperform rating and a $50 share price target, implying a potential ~57% gain, at Imperial Capital, which believes SWN is positioned as one of the lowest-cost producers in the U.S. and potentially taking market share in the midst of a major step-up in U.S. demand for natural gas the firm sees as likely in the 2016-17 period. As a low-cost producer, SWN is one of the few U.S. E&P companies with the potential to flourish in a low $4.00/Mcf U.S. natural gas price environment the firm expects over the next few years. A recent $5.4B property acquisition in the southwest Marcellus and Utica play region from Chesapeake Energy fits what SWN does best and can become a third low-cost core growth area, Imperial adds. Nat gas may just be the outlier in the beaten down energy sector…once the dust settles and the furnaces start to fire up (may happen this week for many) investors will start to recognize that nat gas is local not global (learned that from Zman) and should be assessed on the merits of US demand and not OPEC production output. Post #100 so we get to a nice round number today. Great weekend to all. Here's to a better November than October. 94 – month end mark up perhaps ?